So I remember buying this cassette tape when I was 14 or so after hearing the classic track “Bang A Gong (Get It On)” on the radio. This record changed everything. It introduced the world to the term “Glam Rock” and paved the way for such artists as Bowie and Roxy Music. It is the second album by this British rock group and is ranked #160 on Rolling Stone magazine’s list of the 500 greatest albums of all time and considered the quintessential glam rock recording by many. 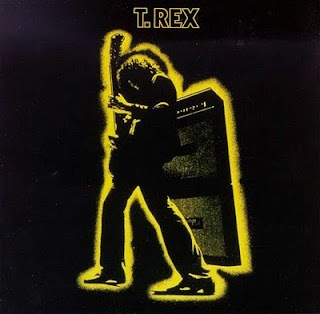 A masterpiece from start to finish, this gem also features other T. Rex favorites such as “Jeepster”, “Girl” and “Cosmic Dancer”.This is essential listening for any music fan and should be a staple in every collection. Check out the rare video from the band’s defining moment in Rock n roll history below.. Now let’s get them into the Hall of Fame. There is already an online petition HERE and the comments are very entertaining. Also check out this great article on the growing list of Rock N Roll Hall of Fame worthy contenders who continue to be overlooked HERE.